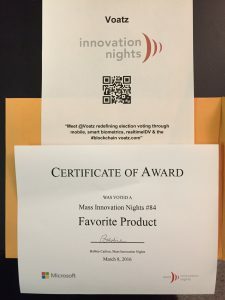 The Voatz team was honored to receive the Audience Favorite award at the Mass Innovation Nights #84 at District Hall in Boston on March 8th 2016. 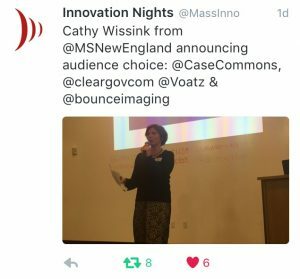 Many thanks to the Mass Innovation Nights team and Microsoft for sponsoring the event and to District Hall for hosting us. 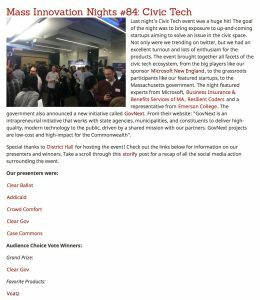 The event brought together all facets of the civic tech ecosystem, from the big players like our sponsor Microsoft New England, to the grassroots participants like our featured startups, to the Massachusetts government. 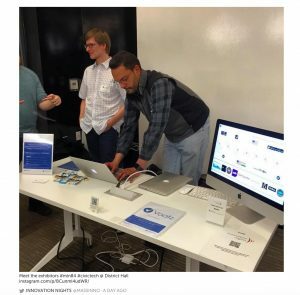 The night featured experts from Microsoft, Business Insurance & Benefits Services of MA, Resilient Coders and a representative from Emerson College. The government also announced a new initiative called GovNext. From their website: “GovNext is an intrapreneurial initiative that works with state agencies, municipalities, and constituents to deliver high-quality, modern technology to the public, driven by a shared mission with our partners. GovNext projects are low-cost and high-impact for the Commonwealth”.